This week I am starting a series of posts about small towns in the USA. Here we are in Carmel, Indiana, one of the most charming towns to be found in the midwest! For this week’s challenge: “Carry,” let’s get the Walking Waffle at the busy Saturday Market! One of the features of the town is the fabulous “arts” district. The Carmel Public Arts Collection includes a variety of media and supports community interests. J. Seward Johnson, Jr., an American realist, was born in 1930. He is the grandson of the founder of the Johnson and Johnson Company. After a career in painting he turned to sculpting in 1968. Johnson has designed and created more than 250 life-size bronze sculptures in North America, Europe, Asia, and Australia. “The Man-on-the-Street” series began in the 1960’s and continues as Johnson creates new ways to express his subjects. Fifteen of these sculptures can be be found at different locations throughout the Carmel Old Town and Carmel City Center. See a map of sculptures Here! Walking through Carmel’s “old town” is such a delight! 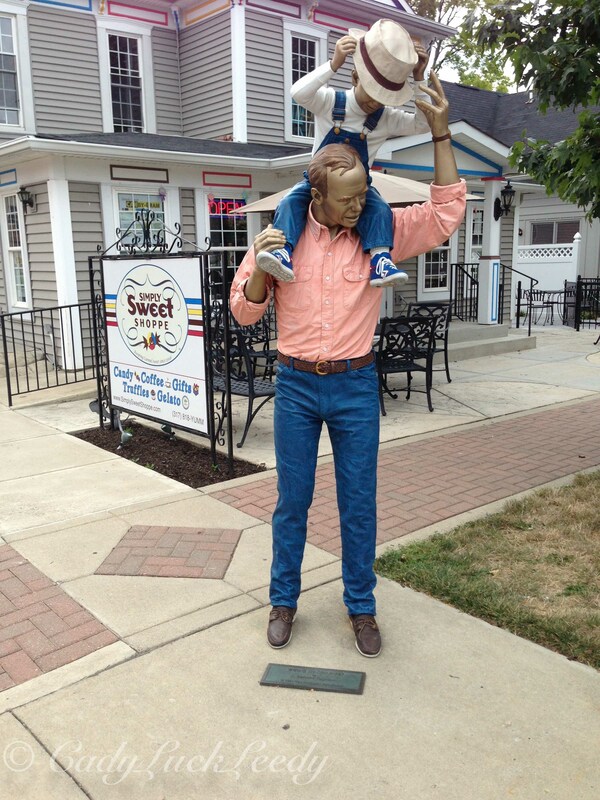 The sculptures look so real and are located in front of shoppes that relate to the sculpture. For more about Carmel, IN, follow my postings on “Small Towns in the USA” that begins tomorrow! Enjoy! Those walking waffles look so delicious.